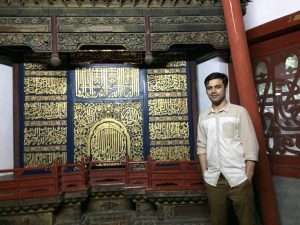 Despite being officially atheist, but most closely associated with Buddhism, China has a deep-rooted relationship with Islam. Amazingly, around 24 million people in China are Muslims. It makes 1.8% of the whole population. 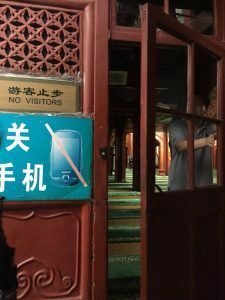 There are a total of seventy-five Masjids in Beijing. Niu Jie Masjid is the oldest of them. 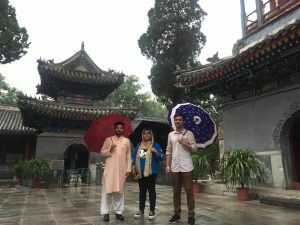 It offers a unique view for foreigners to explore Islam’s knotted history with Chinese culture. 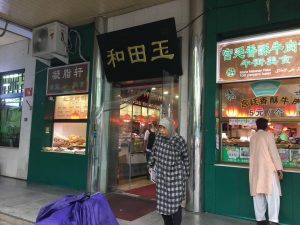 Niu Jie is a perfect blend of Arabic and Chinese culture. 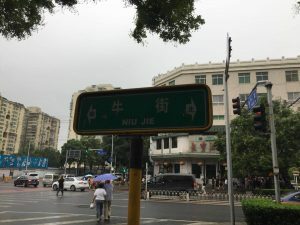 The area around the mosque is also called Niu Jie. 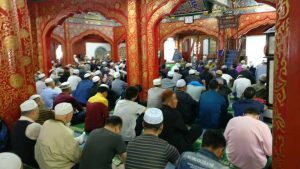 It is located at the XuanWu district of Beijing, where the majority is Muslim, around three hundred thousand. Most of the restaurants serve halal meals. The locals wear traditional Muslim clothes. In the Chinese language, ‘Niu’ means Cow, ‘Jie’ means Street and ‘Qing Zhen Si’ means Masjid. This ancient Masjid was first built in 996 during the Liao Dynasty (996-1125). Later in 13th century, the Mongols razed the Masjid to the ground after they conquered Beijing. It was again built in 1442 in the Ming Dynasty while expanded in 1696 under the Qing Dynasty. Furthermore, the Masjid has been Underwent three renovations in 1955, 1979 and 1996 respectively. Now, the Masjid covers an area of about 6,000 square meters. Obviously, the outer architecture is Chinese, whereas the inside of the building looks more Arabic. There are several buildings in the courtyard of the Mosque, including two separate prayer halls for Men and Women, the Moon house (for sighting the Moon on occasions such as Ramadan and Eid), The Minaret Building (used to call for prayer), The Tablet Pavilions (two pavilions for the big stone tablets inside, written declaration on one side Chinese, on other Arabic), a building for teaching Islam, a building for the staff and another as a canteen, a museum building and there is also a place for martial arts. While walking around the courtyard, one can see Arabic script signs and Chinese architecture designs with mixed color. The traditions Islamic cultured blank & white tiles and fixtures and the rich colored Chinese style roofs and designs make it unique in design and appearance. Many fences and walls are painted bright red, dark green girders contrast sharply with bronze red pillars. Between some pillars, there are “Small Doors” that are a kind of arch not like the Arabic pointed arch style. In the courtyard, you could find a big Caldron which is made of copper and tin in the year 1702. It is mostly used for cooking meals on the special occasions. Now, it is a piece of display for the visitors. The typical Chinese symbols including several animals designs are either engraved or drawn on exterior walls of these buildings. This seemed a bit odd, because as per Muslim tradition, such things are forbidden. But the mythical creatures on the Masjid Chinese-style flared, tiled roofs add an imperial Chinese touch to it. Similar animals can be seen on the eaves of other structures across Beijing, including those in the Forbidden City. They symbolize elements that bring good luck and ward off evil. There has been some new construction which doesn’t have such mythical symbols. In the southeast of the tower are the two historic tombs of the great Islamic scholars, Ali bin Alcazar and Ahmad Burdani, who came from the Middle East to China to spread Islam. Ali bin alcazar died in 1280, while Ahmad Burdani died in 1283. May Allah be pleased with them.